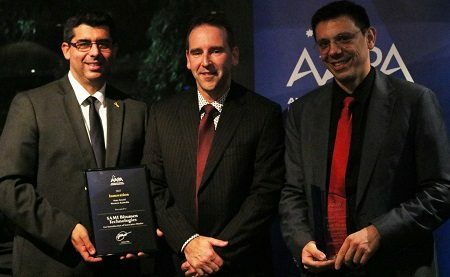 Congratulations to the 2017 AAPA Western Australia State Industry Award Winners. 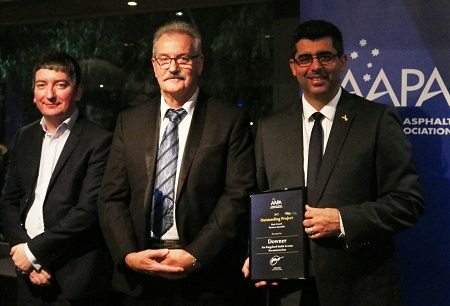 Recently over 100 members and their partners from the flexible pavements Industry came together for the Annual Western Australia State Gala Dinner and Industry Awards. Congratulations to the 2017 Western Australia Safety Initiative Award winner Chad Komarnyckyi from West Coast Profilers. PICTURED: Con Rimpas ASPHALTECH, Chad Komarnyckyi WEST COAST PROFILERS, Carlos Rial AAPA CEO. Congratulations to the 2017 Western Australia Emerging Leader Award winner Emma Lucas from Fulton Hogan. 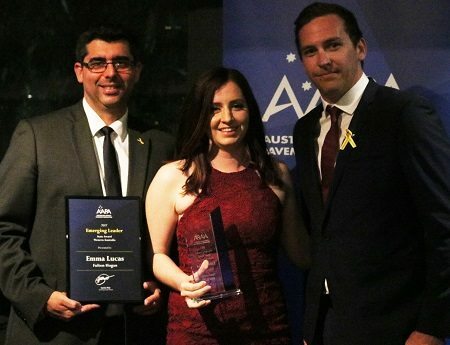 Carlos Rial AAPA CEO, Emma Lucas FULTON HOGAN, Ryan James ALTUS TRAFFIC. Congratulations to the the Western Australia Downer Team for taking out the 2017 Outstanding Project Award for the Kingsford Smith Avenue reconstruction. Stuart Nugent COLAS WA, Morrie Stevens DOWNER, Carlos Rial AAPA CEO. 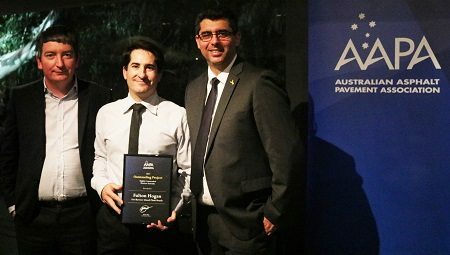 Congratulations also goes to the Western Australia Fulton Hogan Team for taking out a 2017 Highly Commended Outstanding Project for the Barrow Island Plant Roads. 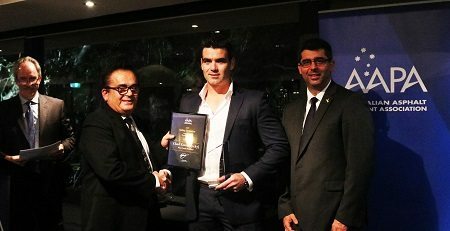 Stuart Nugent COLAS WA, Brett Mottolini FULTON HOGAN, Carlos Rial AAPA CEO. Congratulations to the 2017 Western Australia Road Worker of the Year Sam Barbatano from Fulton Hogan. Carlos Rial AAPA CEO, Sam Barbatano FULTON HOGAN, Con Rimpas ASPHALTECH. 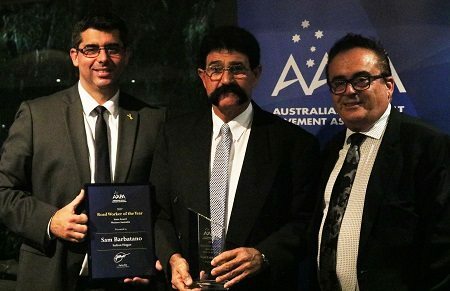 Congratulations to Sami Bitumen Technologies on taking out the 2017 Western Australian Innovation in Design, Process or Product Award for continuous innovation/investment in WA binders. Carlos Rial AAPA CEO, Scott Olsen SAMI, Sebastian Chatard SAMI. 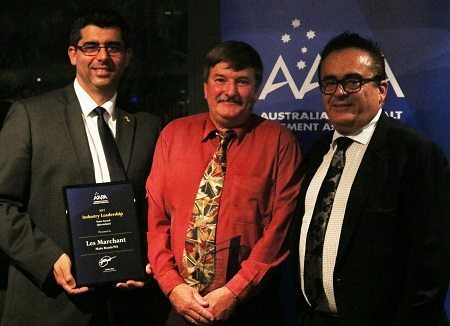 Congratulations to Les Marchant WA Roads for taking out the 2017 Western Australia Industry Leadership Award! Carlos Rial AAPA CEO, Les Marchant WA ROADS, Con Rimpas ASPHALTECH.